We can’t gather the necessary information to house our homeless neighbours solely by counting them anonymously once every two years. Solving homelessness requires actionable, real-time, person specific data to ensure the right people get into the right housing at the right time and communities are armed with the data they need to transform their homeless systems. The CAEH is fortunate to work with communities, organizations and governments across the country who share our mission of ending homelessness. As we travel the country, we tend to hear common questions or encounter similar interests and challenges, so we’ve decided to start a blog on some of those questions, interests and challenges. If you’ve got a burning question or subject you’d like us to dig into – drop us a line! In this first blog we’ll discuss actionable, real-time, person-specific data as the foundation for ending homelessness. Through March and April over 70 communities across the country participated in Canada’s second national Point in Time (PiT) count. A PiT Count is used to enumerate sheltered and unsheltered homelessness in a community. PiT Counts also include an anonymous survey seeking information on the characteristics of a community’s homeless population (e.g., age, gender, Veteran status, Indigenous identity). The PiT is usually completed on one day and provides a “snapshot” of homelessness in a community. These national counts provide valuable data for policy making and research. While this is valuable data, a growing body of experience from Canada and the US is showing that a community can’t gather the necessary information to house its homeless neighbours solely by counting them anonymously once a year or every two years (check out this report by Community Solutions and this blog on the US Interagency Council on Homelessness website). The foundation for ending homelessness is actionable, real-time, person-specific data – we must know and document the names and unique needs of every person experiencing homelessness, identifying and housing those with the most urgent needs first. Since June 2015, 25 communities participating in the 20,000 Homes Campaign have conducted Registry Weeks – a coordinated outreach and triage assessment process to gather actionable person-specific data on every person experiencing homelessness (in many ways similar to a PiT Count but additional information and names are collected, with people’s consent, in order to follow-up with individuals afterwards to offer available housing and support). During the 2018 National PiT Count, 16 communities conducted combined Registry/PiT counts. Having this person-specific data is the critical first step in the housing process. It helps a community make sure they can get the right people (finding and prioritizing those in greatest need first), into the right housing (matching each person’s unique need needs and preferences) at the right time (as quickly and efficiently as possible). When this Registry data is maintained as a real-time By-Name List, we have a powerful tool that gives us a monthly accounting of homeless inflow, outflow and actively homeless numbers which allows us to rapidly target our housing and prevention interventions. NEW VIDEO: Check out this short video to see how a By Name List focussed on ending chronic homelessness works. Six key data points are included in a By-Name List: three inflow measures (newly identified, return from inactive and return to homelessness from housing) plus two outflow measures (housing move-ins and move to inactive), and the total number actively homeless. Armed with the unparalleled visibility of homelessness that you get from a By-Name List, you can monitor your homeless system performance, notice fluctuations, identify problems and respond in real time. Communities participating in the 20,000 Homes Campaign are using By-Name List data to drive continuous improvement in their homeless serving systems. Ending homelessness however, isn’t just about process improvement. Every community invariably runs up against resource barriers. A By-Name List gives you the information you need to confidently advocate for the resources you need to end homelessness. Any fundraiser or lobbyist worth their salt will tell you that a quantified and specific request for resources, tied to data-informed logic about how those resources will result in a better outcome, puts you in the best position to get what you need. Around the country, new resources are emerging (especially Canada’s new National Housing Strategy) to fill critical housing and service gaps in communities. Having real-time data can tell you exactly how much and what kind of housing and supports you need for who and when, and importantly what policy changes in which public systems are needed, to reduce and ultimately end homelessness. By-Name Lists are a powerful tool to make big requests. And finally, real-time data helps keep your stakeholders mobilized and focused on the goal. We’ve seen that even in communities where the number of people actively experiencing homelessness is going up, having a clear and real-time sense of progress provides focus and energy to community stakeholders working to reverse the trend. Shared data enables shared work toward shared aims! Solving homelessness will not happen with a ‘set it and forget it’ mindset. Solving homelessness requires a culture shift to data driven continuous improvement with hands on leadership of the homeless system. 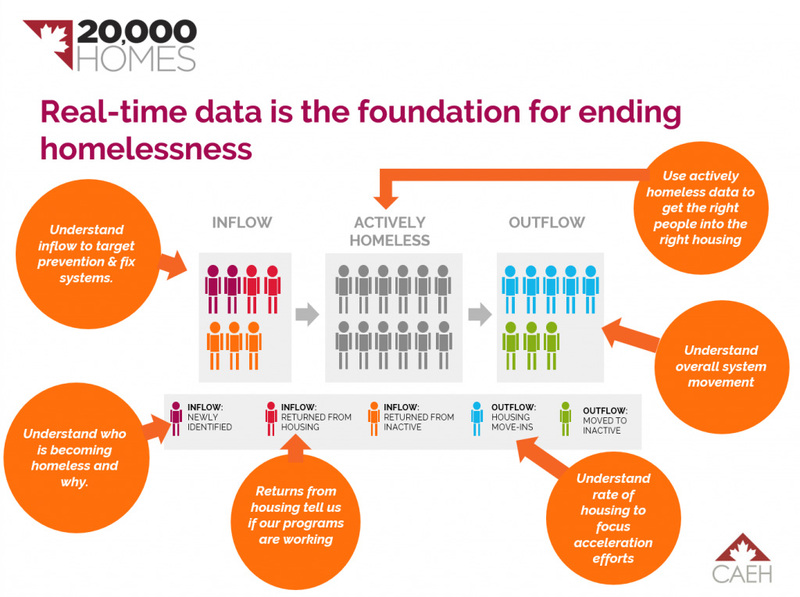 The foundation for ending homelessness is actionable, real-time, person specific data. Want to learn more? For more information on By-Name Lists – what they are and how to get one – see the 20,000 Homes Campaign By-Name List page.